In this city builder you have two main areas to work in. the first is your main city where you can add decorations and businesses. In your neighborhoods, you take part in timed quests to construct various buildings. So for example, you might need to build six homes, upgrade them, and bring in a certain amount of rent. It can be tricky to complete the task in the time allowed but it adds a tremendous amount of strategy and thinking into the game. You can add several different neighborhood types to your growing city but most cost game credits, which is disappointing. Other things you can do include collecting money from businesses and adding decorations to keep your citizens happy in the game. Build-A- Lot Metropolis isn’t the best-looking city builder and the timed quests get tiring after you do so many of them. There’s a small assortment of decorative options for your city but the list needs to be larger. The decorations include trees, shrubs, a fountain, food carts, plaza, barn, and statues. There’s some additional scenery but again it costs game credits making this a game you really can’t enjoy without some investment on your part. There’s several different business for your city but not many at the lower game levels so your city ends up being a clone. You’ll find your typical stores, coffee shops, restaurants, and hotels. There’s not enough selection here on the free side either with most of the better structures costing cash. While this is a city builder it’s not a very enjoyable one. The redeeming feature for the game is the strategy section of city building. When you build a neighborhood, you’ll get to take part in completing jobs. These jobs are timed and include constructing homes, making rent, and selling finished properties. During the timed event, you’ll have to work quickly to sell or buy both land and properties. You can also upgrade properties to make more income as well as paint them for more income. These strategy elements will appeal to gamers who like that sort of thing but for those who just want to build a city this will prove to be very frustrating. You don’t get to keep your finished work you just move onto another job at a higher difficulty. You can take the job over again if you fail the mission. There’s no real multiplayer feature in the game besides visiting your friends city and doing a small task. There also doesn’t appear to be a gift feature at this time, which is needed. The game needs to add some multiplayer features for it to succeed on Facebook. 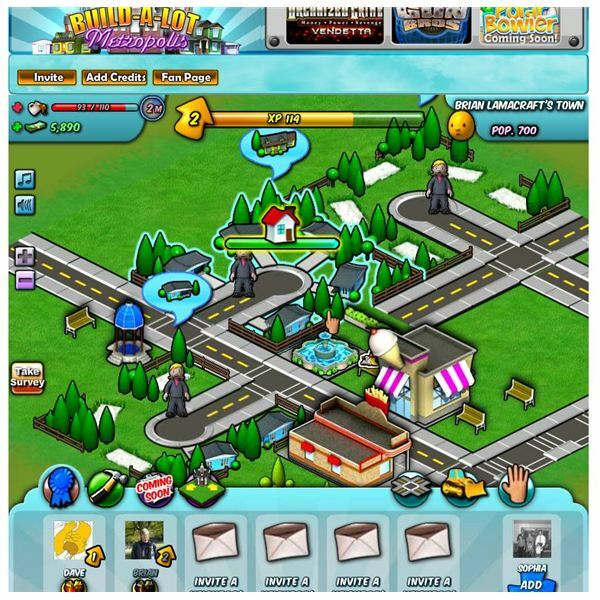 Without some sort of gifting feature the game has no real social elements to it and players will move onto other games such as CityVille which is better than this one. Build-A- Lot Metropolis isn’t a true city builder and it’s not a very fun game unless you like timed strategy games. The jobs you complete in the neighborhoods can be fun but for only so long since they are timed and the same basic jobs. The game doesn’t offer a great selection of build options and many of the nicer ones cost game credits to own. There appears to be some features that are coming soon so they may add to the game play somewhat but right now there’s better city builders on Facebook. The game does have a soundtrack and the individual building graphics are decent but the city doesn’t look that great on the game map since the neighborhoods tend to blend into each other with the jobs avatar taking up a lot of space. Having the jobs and icons at the side of the game would clean up the game play area. The roads do look nice along with the decorations. The neighborhoods change in a appearance as you do the jobs which can brighten up the city a bit. 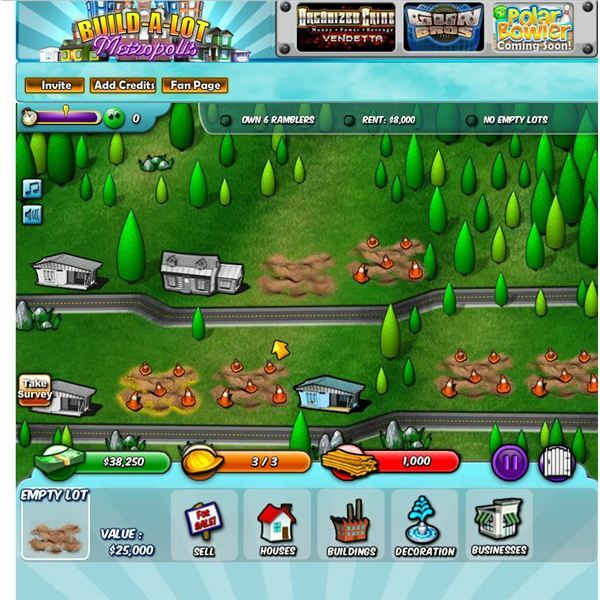 The game features your average interface with the build icons at the bottom of the screen. The menus load quickly as you play. When you are in the mini jobs game the options can be a bit confusing and you need to work quickly to figure it al out before the timer runs out. 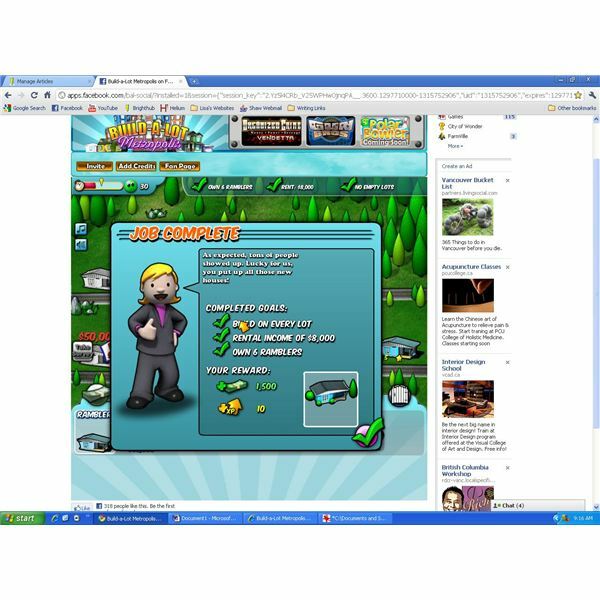 The interface is what you would expect in a typical Facebook game. Build-A-Lot Metropolis has some decent features but doesn't come toigether as a full city builder. Players who like timed strategy may have fun with the jobs but for most players it doesn't make for great city builder where you can take your time and see your city grow. The game needs more things to build and some decent multiplayer features before it can compete on Facebook wiith the other city building games.